This neighborhood-friendly design is ideal for a narrow lot with multiple front-facing gables and a front-entry garage. The open kitchen overlooks the breakfast room and a dining room is nearby. Skylights highlight the cathedral ceiling in the great room and a separate living room is just steps away. The master suite offers access to a private rear deck and the master bathroom is luxurious with a dual-sink vanity, soaking bathtub and a walk-in shower. Two additional bedrooms share a bathroom and have access to spacious storage in the hallway. 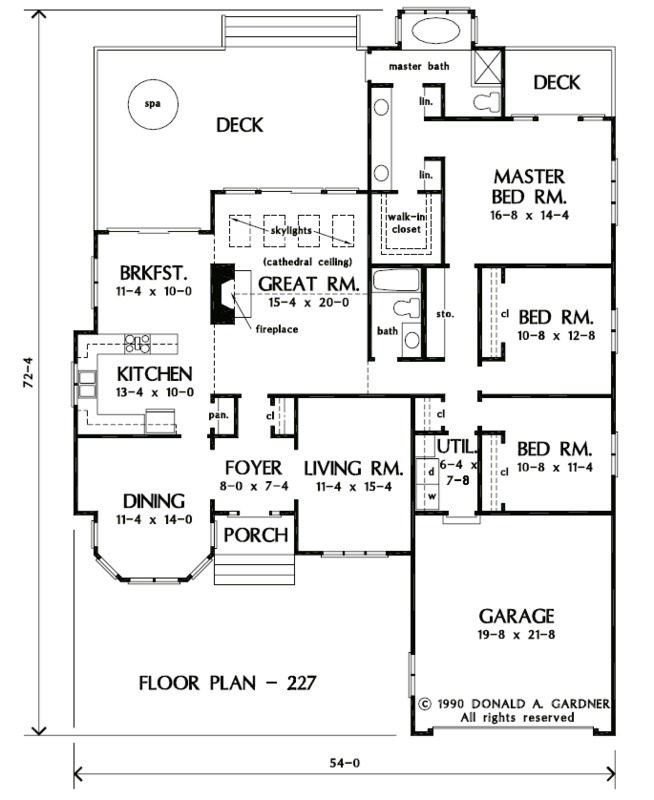 House Dimensions: 54' 0" x 72' 4"
Master Bedroom: 16' 8" x 14' 4"
Foyer : 8' 0" x 7' 4" x 8' 0"
Great Room (Cathedral): 15' 4" x 20' 0" x 14' 6"
Kitchen : 13' 4" x 10' 0" x 8' 0"
Utility Room : 6' 4" x 7' 8" x 8' 0"
Garage : 19' 8" x 21' 8" x 0' 0"
Master Bedroom : 16' 8" x 14' 4" x 8' 0"
Bedroom #2 : 10' 8" x 12' 8" x 8' 0"
Bedroom #3 : 10' 8" x 11' 4" x 8' 0"
Porch - Front : 8' 0" x 4' 0" x 0' 0"
Porch - Right : 11' 0" x 7' 0" x 0' 0"
Deck / Patio : 27' 4" x 14' 4" x 0' 0"
Living Room : 11' 4" x 15' 4" x 8' 0"
Storage (1st Fl.) : 1' 10" x 9' 0" x 8' 0"